You’ve been able to pay for things with your mobile phone for several years, but most people still pay with plastic. That might change: Apple Pay brought mobile payments into the spotlight, and it may result in a lot more phone tapping at cash registers. Why would you want to pay with your phone? Aside from just being cool, there are several practical reasons. 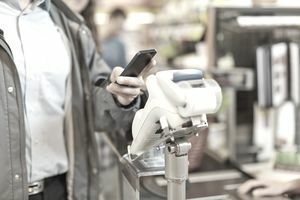 Security is one of them: mobile payment tools can provide more security than traditional magnetic-stripe cards, which are susceptible to skimming and data breaches (although this benefit will diminish as chip-and-PIN cards take over). You also might find it easier to pay by phone; if you’re like most people, you’ll always have your phone on you – so you can get a lot done without carrying cash or multiple cards. How do you pay by phone? Assuming you want your phone to replace your current method of spending with debit and credit cards (and occasionally cash) at brick-and-mortar locations, this page will tell you how to do it. But there are other ways to make electronic payments with your phone. For example, you might want to send money to friends or pay a contractor – and those individuals don’t have payment terminals for credit cards or tap-to-pay. Those types of mobile payment tools are listed here: How to Send Money. iPhone 6 or newer (including Apple Watch). Android phones made in recent years. Newer Windows and Blackberry devices. If you’re not sure if your phone works with NFC, check the manual or search through the phone’s Settings. Apple Pay, which features a payment system that keeps merchants from seeing your personal and financial details. Google Wallet, which is available on numerous affordable devices. Softcard, which is available as an app, works with merchant loyalty programs and can turn some non-NFC devices into NFC phones with a special case. Wallet for Windows Phone, for Windows Phone users. NFC terminal: All of this only works when a merchant can accept payments from your mobile phone. Some places don’t have the right terminals installed for cashiers (at least not yet), and they might not know how to accept mobile payments even if they have the equipment. Assuming you have everything listed above, you’re ready to use your phone for payment. So what’s the process? In most cases, you’ll go to a cashier as usual. When it comes time to pay, touch the payment terminal gently with your phone. Depending on your device and your mobile wallet, you might or might not need to “wake” the phone or unlock your wallet before doing this – you’ll figure that out after a few tries. At some point during the transaction, you’ll need to verify your identity (with a PIN, fingerprint, or another method), and then the payment will happen. Again, the merchant might not be completely ready for mobile payments, so you might need to ask a cashier to enable NFC payments. Jailbroken or rooted devices carry extra risk – if your device is infected with malware, your payment information may be compromised. Use a strong identity verification system: a long PIN, strong password, or biometric characteristic. Use security features that help you find a misplaced device or that “wipe” a lost or stolen device. Mobile payments might make your life a lot easier. But you might not want to leave the house without other forms of payment just yet. Retailers have not completely warmed up to the idea, so you’ll need to pay the old-fashioned way from time to time. Then there’s the problem of a dead battery – the more we depend on technology, the more we really depend on it (your cash, checks, and cards work whether or not your phone does). Ultimately, paying with your mobile phone might be an additional option that you use when it’s available. After a few years, the world will catch up with your desire to pay this way (in part due to laws requiring better payment terminals that accept chip-and-PIN or EMV cards). Until then, maybe swiping a card isn’t all that bad.